Olive Tree let their Bible by Olive Tree for Android app languish in mediocrity for a couple of years, but that ended this June with a nice update to the Bible+ by Olive Tree app for Android. It sports a whole new polished look that feels more like a modern Android app than the earlier version. 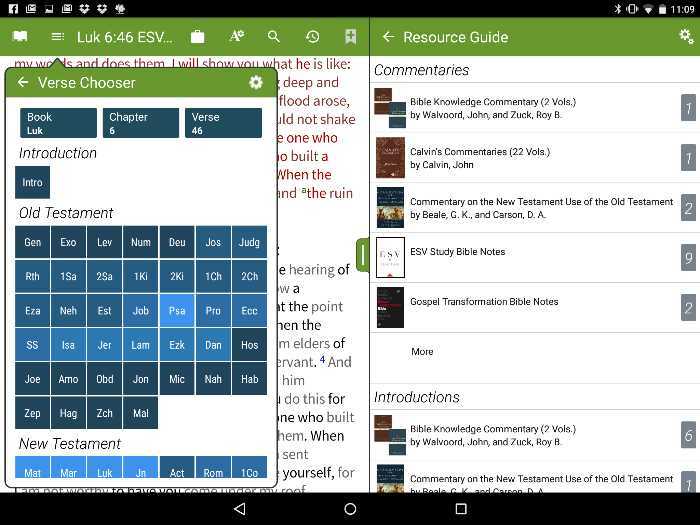 What’s new and should you get Bible+ by Olive Tree for your Android phone or tablet? Install the app from the Google Play Store. Also watch my interview with LaRosa Johnson of Olive Tree. There is also the Movie Box, which you won’t find on the main store, even though it can entertain with hours of movies. He will be a guest on the Theotek Podcast on Friday, June 5. One of the most obvious changes comes with the new look of the user-interface in Bible by Olive Tree for Android. Google promotes something called Material Design, which means they’ve created some standards that they hope app developers will follow. Material Design gives Android apps a unified look and Bible+ follows the standards quite well. The Book, Chapter, Verse Chooser shows off the new look of the app. It’s more colorful and that makes it easier to see what’s on screen and interact with it. 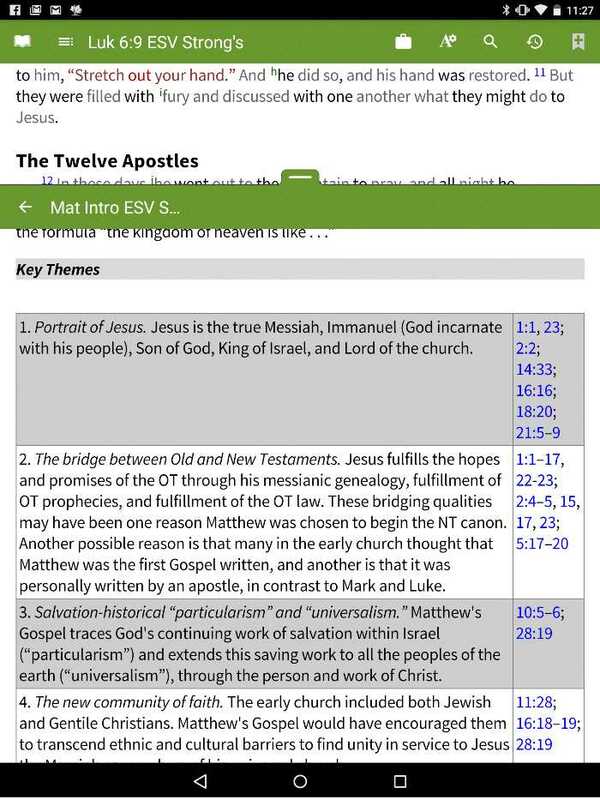 Material Design in the Bible by Olive Tree for Android app. Olive Tree describes their new look as “bold color and flat icons” which is correct. The app looks better and closer to the iOS version, which Olive Tree clearly put more effort into developing before this. Let’s hope it doesn’t take another two years to get a nice Android update. Take a look at the Strong’s dictionary pop up to see an example of the more attractive looking user interface. Open a Bible with Strong’s tags and tap on a word. The box pops up giving the Dictionary Definition, the Strong’s number for the word, and two buttons. One button searches the Bible for that Strong’s numbered word. Searching is fast. Tap on a result to jump to the verse. Tapping on the Look Up button will open a list of all the dictionaries and user notes for that word that the app can find. Tap one to open it inside the pop-up. This makes word studies easy. Now, in Bible+ users can highlight more than just a verse. They can select one word or a phrase and highlight it. They also added the ability to highlight non-Bible books, which is hard to believe you couldn’t do before on Android. Select text and the toolbar shows up. 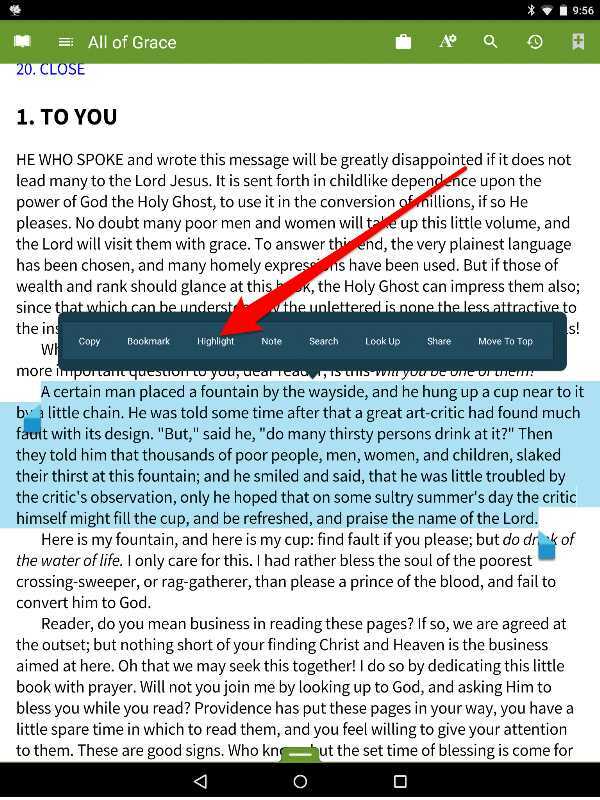 Tap Highlight to add your highlights to any text in any book, not just whole verses in a Bible. In either case, select what you wish to highlight and the highlighting toolbar pops up hovering over the text just above the part selected. Tap on highlight. The new highlighter box pops up with the various colors the user can use to highlight. Tap on one of the highlighter colors and it applies the highlight to the selected text. The highlighter tool includes five colors by default (yellow, pink, purple, green, and blue). You can add new colors or rename the included colors with things like “sermon notes” or “sermon illustrations” or whatever you like. At the bottom of the highlighter color selector box there’s a couple of buttons. Tags let users add tags to a highlight to make it easier to find. Categories will gather highlights into a category. Some of the best improvements won’t show themselves obviously to the user. However, over time they will notice that things run smoother and faster. The text gets displayed better and overall performance is better, at least that’s the promise. The app still stalls a little while drawing the screen and loading a book. This show sup for about five seconds. On my Nexus 9 and Samsung Galaxy S6 Edge, two of the newest Android devices running Android Lollipop 5, usually run Bible+ faster, but opening a new book still results in the Android circle that shows the OS is still working and you have to wait for it to finish what it’s doing. In other words, the devs at Olive Tree need to do some more work optimizing the app’s speed and user-interface. Once the app does draw the screen, which usually takes about five seconds, and loads everything, the app’s clearly faster and scrolls smoother. 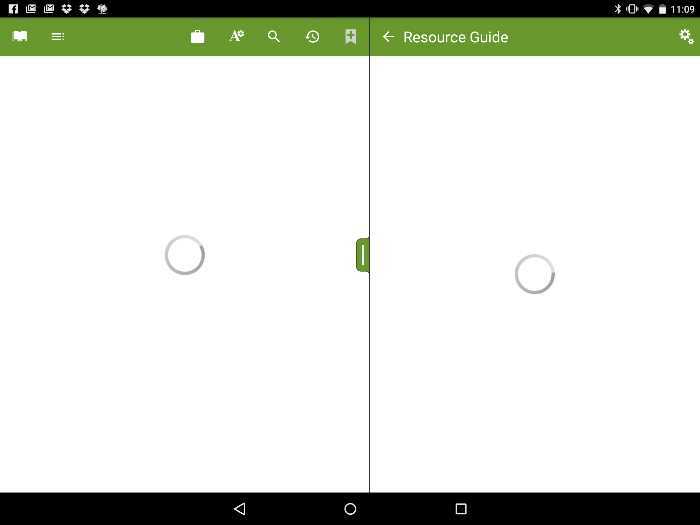 The handle that opens the second window is smooth and lets me open the Resource Guide quickly. The new display engine allows them to add visual elements like table and text wrapping around images. Thanks to these under-the-hood improvements, new kinds of resources become possible. For example, study Bible’s with things like tables, can now show them as tables. The iOS version could do this for a long time, but the Android app was way behind in this area until now. If you have the NIV Study Bible app you will see an example of this. Open it to John 3 and you’ll see a table in the notes. The included screen shot comes from the ESV Study Bible Intro to Matthew. This same display engine lets them layout with text flowing around visual elements. That seems like a minor thing, but the Android app couldn’t do it before this version. Thankfully Olive Tree caught up with 2015. While the Resource Guide isn’t new, it deserves mention since it’s such a useful feature. At the bottom of the window you’ll notice a handle. Pull it up by tapping and holding on it and then swiping up. This opens a second window. Open settings to customize what resources show up in the Resource Guide. At the top left corner there’s a drop down box. Tap it to show the list of available resources. Library opens the user’s library so they can open a second book in that second window. Tap on My Stuff to open things like Notes, Bookmarks, Highlights, or Book Ribbons. Tap on the Resource Guide, which serves as a digital research assistant ready to show the user all of their books related to the passage in the first window. On the top right corner, there’s a settings icon. Tap it to customize what kinds of resources will show up in the Resource Guide. It also lets the user order their resources. For example, I’ve put my Commentaries first, followed by Introductions, People, Places, Maps, and then left the rest of the items on the list alone. Now when I open a passage in the first window, the Resource Guide will show me all of my commentaries in the second window ready to open them to that passage. It also shows me book introductions so I can learn what’s going on in that book of the Bible. Then it shows me information about people, places and any maps that might relate to the passage. The Resource Guide offers other things like related verses (cross references), notes that I’ve written on the verses in the passage, images from books in my library that are tagged with this verse or topics from the verses and much more. Other Bible apps offers something like the Resource Guide, but the Bible+ app from Olive Tree executes it in one of the best ways available. This reason alone makes it one of the best mobile apps available. 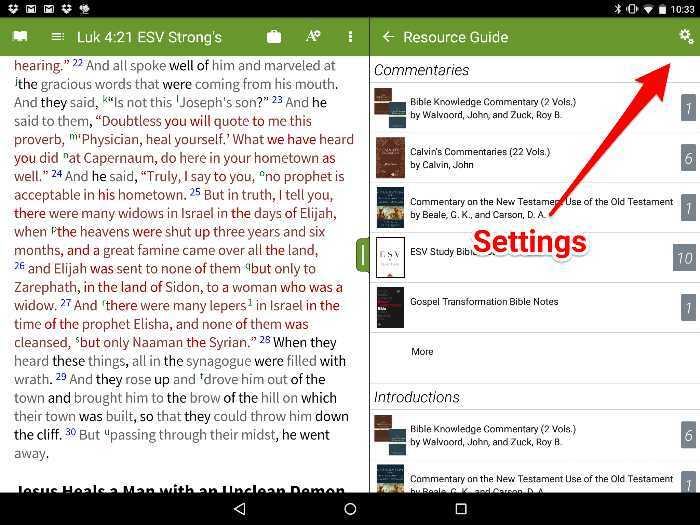 Here’s some of the other new features available in the new Bible+ for Android. The new app display engine can finally show Interlinears, like the ESV Greek-English Interlinear. It goes beyond what the Strong’s tagged Bibles offer. Tap on the Greek word and it shows the word, Strong’s numbers, parsing information and will search for the word in all forms, not just the form in that verse. Tap just the Strong’s number to see the Strong’s dictionary entry, like you would with the ESV with Strong’s tagging. If you want to search for the word as it’s used in that verse with its present format, it will do that too. That way you can find other instances of a word with the same parsing. Bible+ for Android uses a new font that looks better and supports formatting better. It’s more readable. Open the app and you’ll notice how prettier the text looks. There’s a crispness that wasn’t present before. Part of me wants to say, “About time!” I used to use the Bible+ app on my Android phone and iPad all the time. It was my go-to app for public use as I listened to preaching, took part in group Bible studies and even when I preached or taught using my Android phone as my Bible. As the app fell further behind other Android apps, I retired it. Even though the app continued to improve on iOS, I didn’t use it because I wanted a consistent user-interface on both platforms. Other apps from Logos and YouVersion did a better job of keeping both platforms up to date and fairly consistent. Now that Olive Tree finally updated the Android app I’ve used it more. I’m still leery of their continued commitment to Android. After this update will they again start to ignore the app in favor of other projects? They put Apple Watch support in the iOS app almost right away, but Android Wear watches have been around for a year, yet we still don’t see Android Wear support. That’s a signal to Android fans that they might not yet be serious about Android. Let’s hope they are and the next six months will tell the story. There’s room to improve the app since it does crash on occasion. While writing this article, it crashed three times in about two hours. That’s got to get fixed and I’m confident Olive Tree will. Should you give Olive Tree another shot on Android? Definitely! Former users should grab the update and poke around in it. If you use another app and are happy with it, download a free version and give it a look. I doubt that many will make the switch based on this build alone, but you might. Olive Tree offers a large library of books which makes it an attractive option. The improved Android app deserves a close look from old users who moved on out of frustration, like I did. I don’t but I asked a friend who works at Olive Tree to check it out. Thank you, Kevin. I absolutely love this app. I can switch between various publications of the bible depending on which one the person preaching is using; I can organise my notes into various categories and when I am using them in a devotional way the hyperlinked references are so helpful. It is just not the same experience on the Android and if there is a knack to it I would love to be able to show my friend so that she can also get the most out of Olive Tree. I appreciate your help, Gemma. Gemma, in the latest versions of our app on Android & iOS the notes work fairly similarly, with only minor variations between them. On both, Scriptures are hyperlinked automatically after a note is saved. On Android, if you close & re-open the note, passages that it could link can now be tapped, and the notes pop-up will switch to the passage. The button at the top right of the pop-up then allows you to open that passage in main/split window. The only major caveat is that the pop-up closes once you select to open it in another window (I believe on iOS the pop-up stays open). While viewing the passage in the pop-up, tap the back arrow to return to the notes. Also, unlike iOS, you have to tap the edit button to continue editing a note, whereas you just tap on the text to begin editing on iOS. Thank you @larosa217 I will give this a go on my friend’s tablet. I appreciate your assistance, Gemma. I am an avid user of Olive Tree, but the latest release did have some glitch on hyperlink pop-ups, i wonder if your experiencing the same, once a Bible Text Hyperlink is saved on a note it usually displays on a pop-out window the text reference on the Bible without losing the note, however with the latest update the hyperlink opens the text on the same page thus leaving the note i am reading, i have to then tap the back arrow just to get back to the note, i have changed the Advanced Options on Hyperlinks many times to go on Pop-up but still fails, any idea why this happening, i’m using Samsung Galaxy Tab S 8.0 on Kitkat, thanks!